In order to identify what the emerging Digital Marketing trends are and where your should invest your Digital Marketing budget in 2015, you first need to look at what happened online in 2014. 2014 was a year of significant change in Digital Marketing, with 2014 being the first year that advertising spend on Digital Marketing exceeded the marketing spend on both Press and Radio Advertising in Ireland. 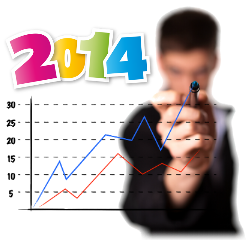 2014 was a good year for New World Digital, with growth in both clients and staff throughout the year. We increased our annual turnover by 61%. We were also nominated for 12 Realex Fire Web Awards and were finalists in 4 categories including Best Web Design Agency. It was also a great year for our clients as we generated over €30,113,000 worth of leads for our clients online. Two key areas saw significant changes during 2014. These are SEO, and Website Design itself. Every year, Google changes its search algorithm 500 to 600 times. Most of these are small changes and don’t have a large impact on your rankings. The updates outlined below summarise the larger updates in 2014. Page Layout # 3 (Feb 2014) – Google changed the page layout algorithm. Originally launched in 2012, the page layout algorithm update penalizes sites with too many advertisements above the fold. Payday Loan 2.0 (May 2014) – Google updated its “payday loan” algorithm which targeted specific sites that generated spammy queries. Panda 4.0 (May 2014) – Google updated its “Panda” algorithm with over 7.5% of English language sites affected. The change was to prevent websites with low quality or duplicate content making their way into search engine results. Payday Loan 3.0 (June 2014) – Google updated its “payday loan” algorithm with a second anti-spam update which targets websites that generate spammy queries. Pigeon (July 2014) – Google changed the local SEO with an update that uses your location while searching to decide the most relevant listings. This meant that local companies could rank well for generic search terms at a local level. HTTPS/SSL Update (Aug 2014) – Google started giving a preference to secure sites, so that adding encryption could provide a small rankings boost. Panda 4.1 (Sept 2014) – Google updated its “Panda” algorithm again with about 5% of English language sites affected. Once again the Panda update was aimed at sites with low quality or duplicate content. Penguin 3.0 (Oct 2014) – Google updated its “Penguin” algorithm again with about 1% of English language sites affected. Pirate 2.1 (Oct 2014) – Google updated its “Pirate” algorithm again to combat software and Digital Media piracy. The update was highly targeted with a relatively small number of sites being targeted. However websites that were targeted saw significant losses in impressions, traffic and revenue. To summarise the Google changes in the last year, it is all about having a well built site with good quality, unique content that your audience will want to read. Web Design has transformed in 2014, driven by the huge increase in traffic on mobile devices, in particular on mobile phones. Companies are now getting up to 60% of visits to their websites via mobile devices. This has led to a huge increase in the number of companies using responsive website (this means the website responds to the device and will present itself in the most appropriate style for a mobile phone, tablet, etc. based upon the size of the screen and the way the device is being held. Responsive Web Design has pretty much replaced mobile websites (which were a second website) across many industry sectors. This is not to say that some companies should not have a mobile site, but these are very much in the minority. For the vast majority of companies a well designed and build responsive website will ensure maximum engagement and traffic to their sites without incurring the cost of building and maintaining two separate sites. In summary, if your website is not compatible with mobile devices, the starting point for your Digital Marketing Strategy should be to get a responsive website with well written, unique content that your potential customers will want to read. The industry is maturing and decision makers are finally starting to take Digital Marketing seriously due to the potential returns and the benefits of having a highly measurable marketing tool at their disposal. All predictions for 2015 indicate the this year Digital Marketing Spend in Ireland will exceed marketing spend on press, radio and TV so this really will be the year that Digital Marketing comes of age. We are looking forward to 2015 being a great year for our clients and with the rapid growth in the Digital Marketing Sector we are looking forward to working with new clients on more exciting projects.